Tiller Publishing has also created the handsome Trumpy Art Print to complement the publication of TRUMPY. This spectacular art print features 25 of the exquisite full-color paintings and drawings from TRUMPY. The deep blue background and rich gold type highlight Robert Picardat’s stunning renderings of such elegant Trumpy yachts as Sequoia II, the Presidential Yacht from 1933-1977. 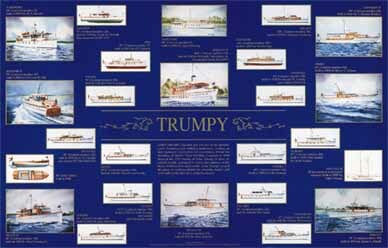 Printed on high quality, acid-free paper, the Trumpy Art Print will grace the walls of any true lover of beautiful boats. Marine Artist Robert Picardat was born in Petersburg, Virginia, and is a graduate of the Richmond Professional Institute of the College of William and Mary. His varied background in architecture, advertising and commercial art led to his distinctive style of painting seascapes and portraits of many of the most prestigious yachts in the world.